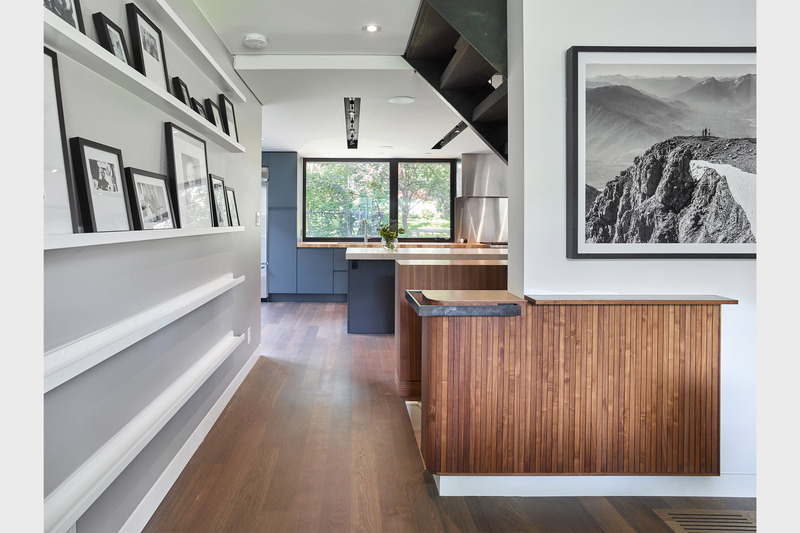 The clients deeply value connecting with their friends, family and neighbours, however their two-story 1950s home in Humber Valley Village dubbed “Hibou House” needed an update to maximize its potential for modern entertaining and living with two adolescent children. 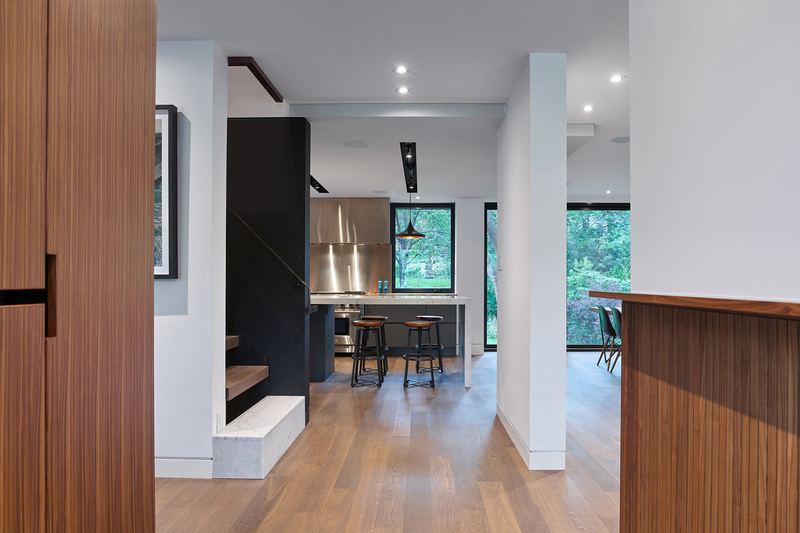 The couple hired Toronto-based Barbora Vokac Taylor Architect to renovate their home’s 1,200-square-foot ground floor with a newly designed layout that is open and centred on the kitchen to facilitate social cooking, a key activity in their house, both with friends and family. 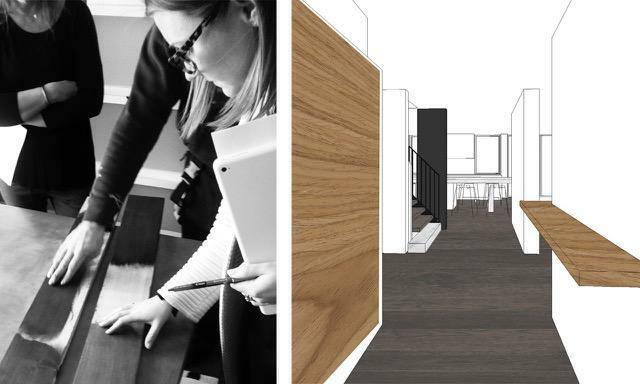 While many designers adhere to the adage that “form follows function,” Vokac Taylor and her team take the approach that “form follows behaviour.” They work closely with clients to get a sense of their daily routines and preferences, then choreograph that behavior into the layout and flow of the space. “Another component is how that space feels,” Vokac Taylor notes. “It’s not a spoken goal necessarily, and sometimes it’s hard to articulate, but we get that sense from working with clients. Then it is pitching certain palettes, and we all know when the right one comes along.” To reach this consensus, Vokac Taylor and her team create wireframe 3-D visualizations and collage materials on top of them, but they avoid making the models look photo real, which she believes is never truly representative of the final product. In the reimagined Hibou House, the material palette is both subdued and raw: Unfinished steel details contrast with warm woods and clean white volumes. The design showcases distinct elements that serve as focal points, such as millwork fashioned with reeded walnut panels. A sense of warmth and intimacy within the open layout is framed by the modest ceiling height and dark smoked oak floors (Relative Space’s Sumo with an oil finish). According to Vokac Taylor, the clients now openly express how house-proud they are. They have hosted many parties and also have neighbours casually stop in on a regular basis. Their house is a hub for friends to gather – both their own and those of their kids – a warm space that can also accommodate easy entertaining.